After 19 days in the hospital, New York’s now former Ebola patient, Dr. Craig Spencer, finally left Bellevue on Tuesday afternoon. But before he could go home to his very clean apartment, he had to — or got to! — hug a lot of people, including some of the nurses and doctors who treated him, Doctors Without Borders executive director Sophie Delaunay, New York City health commissioner Dr. Mary Bassett, Chirlane McCray, and, of course, Mayor de Blasio. 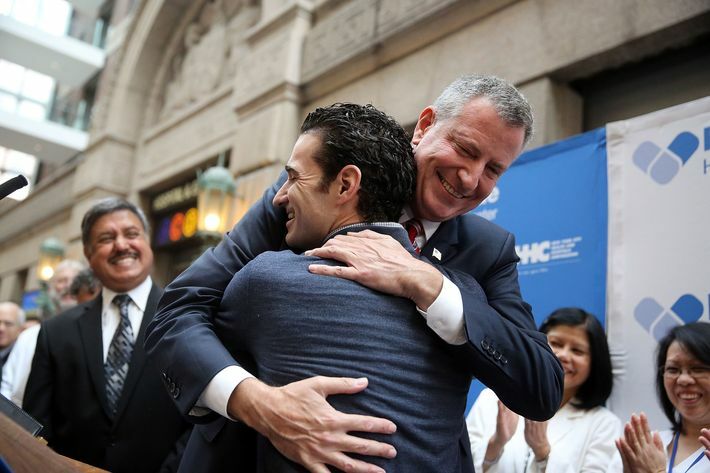 “It is a good feeling to hug a hero,” said de Blasio, just in case anyone out there was still worried about somehow catching Ebola from Spencer. “While my case has garnered international attention, it is important to remember​ that my infection represents but a fraction of the more than 13,000 reported cases to date in West Africa — the center of the outbreak, where families are being torn apart and communities destroyed,” Spencer said. And in a nod to the not-so-widespread panic over the idea of doctors and nurses spreading Ebola in the United States, Spencer praised “the effectiveness of the protocols in place for health staff returning from West Africa at the time of my infection.” “I am a living example of how those protocols work, and of how early detection and isolation is critical to both surviving Ebola and ensuring that it is not transmitted to others,” he added. Spencer’s fiancée, Morgan Dixon, remains under quarantine through the week, and the medical workers who came into contact with him will now be monitored for Ebola’s 21-day incubation period. However, his recovery — which followed that of Dallas nurses Nina Pham and Amber Vinson — means there are no longer any known cases of Ebola in the U.S.